Green electric fence netting of the highest quality - "Made in Germany"
There are many reasons why animal owners opt for a Euro-Net rather than an electric fence. 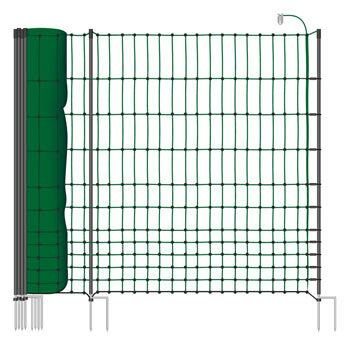 For some, visibility is important as they don’t wish to erect an unsightly fence in the garden or want the fencing to blend in with the natural surroundings. 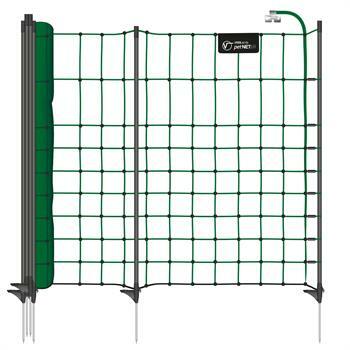 A green Euro-Net is a great choice in such cases. The “Netting – green” section includes various sizes and materials so that you can find suitable green electric netting at an affordable price for every animal and every purpose. What are the advantages of electric netting? 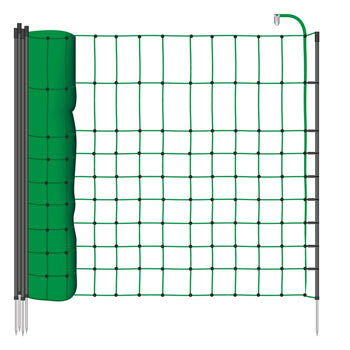 Electric fence nets offer double the safety through a mechanical and an electrical barrier. 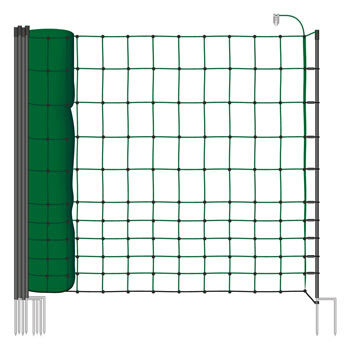 Electric netting can be used for the widest variety of animals from pets and poultry to cattle in the fields or wild boar in the forest. 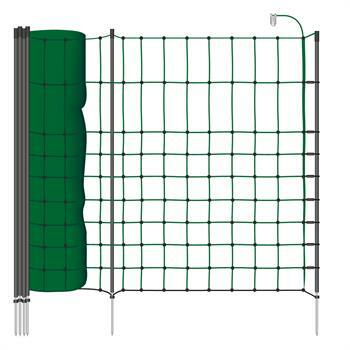 With a net for small animals or a pasture net, not only are the animals effectively fenced in, they are also protected from dangerous intruders. Erecting affordable electric netting is quick and easy to do. Affordable electric netting can be used on a mobile or stationary basis and, if necessary, it can be assembled and disassembled. It can also be extended as required. 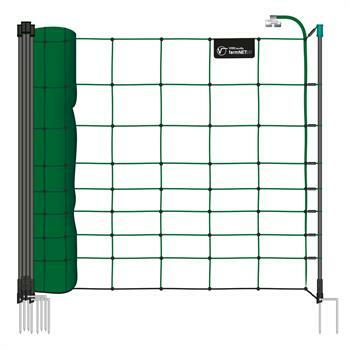 In addition, the broad range of products and the high quality of the Euro nets provides for a wide scope of use and many years of satisfaction. 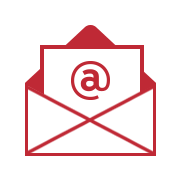 What is a green Euro-Net suitable for? 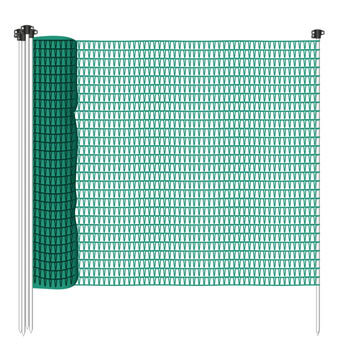 Affordable green Euro-Nets tend to be used in the garden. They blend seamlessly into the background so that they do not disrupt the view for garden owners, the neighbours or passers-by. 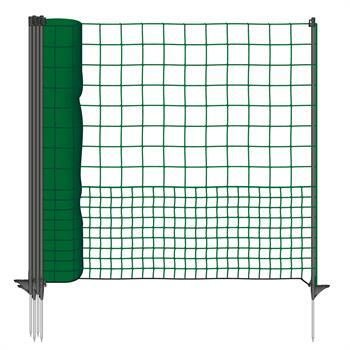 A green Euro-Net is particularly appropriate for use on small plots of land or in town, as it is barely noticeable. Thanks to the natural fir-green colour, the enclosed animals will also be far more relaxed than when bright colours are used, which they may perceive as a stressful permanent warning. Dog, cats, rabbits and poultry can be safely fenced in, in this way. 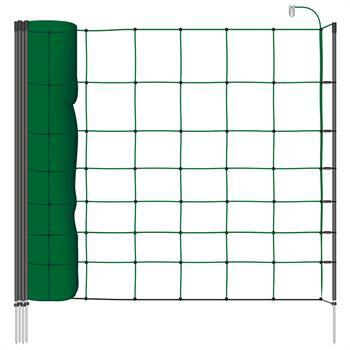 By purchasing a green Euro-Net from our online shop, you are investing in a net for small animals, a pasture net or a net ensuring protection against wild animals offering high-performance capability, regardless of the colour. 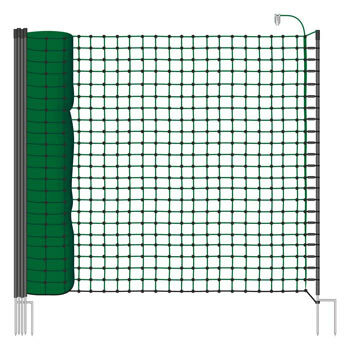 A “made in Germany” Euro-Net, for example, offers a high degree of safety as it is user-friendly, weather-resistant and hard-wearing. Green netting not only keeps pets and small animals safe, but also protects sheep, goats and pigs. 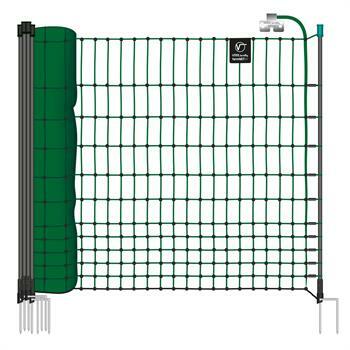 The narrow mesh of the Euro Net is made of UV-stabilised plastic polywire. 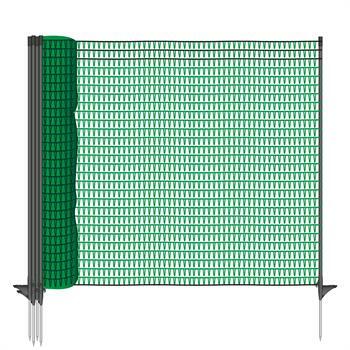 Inside, the mesh contains polywire which supplies the net system with electricity. 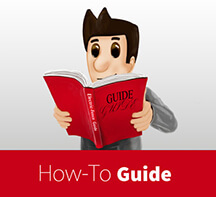 An energiser with mains connection or a battery device is responsible for supplying the electricity. In general, you will need to purchase the energiser in addition. The electrifiable safety net is assembled or erected using plastic posts or metal sakes. These are driven into the ground at specified distances, whereby the Euro-Net can be erected in a square, round or free shape. The support posts with a double spike – often in black – ensure stability. 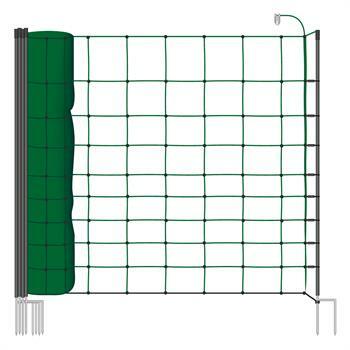 Fir green electric netting on uneven ground can be secured with additional posts and pegs.